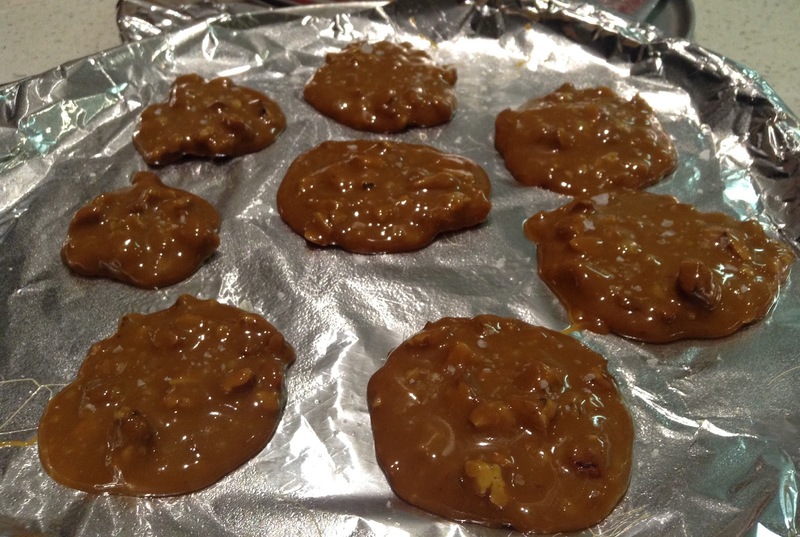 The Scheherazades, which were the Baking Bible project for last week, are caramels with pecans, and they are delightful, sweet and (sickeningly*) more-ish. I was wondering what occasion would be appropriate to make these (is gluttony an occasion?). One of my aunts used to make caramels at Christmas, half dipped in chocolate, and I think these caramels would fit nicely in the Christmas biscuit/sweet genre. *If you keep eating them. These were a bit of a disaster for me since I kept forgetting to take them to work and so I'd come home and eat another one each night...until there were none to take anywhere. Look at those beautiful bronzy colours in that saucepan. Not to mention the three different types of sugar. The bronze is reflected from the golden syrup. I recently bought a tin of the English Lyle's golden syrup which Rose recommends. I've always used an Australian brand syrup which is perfectly good, but on tasting the Lyle's I think I may have been converted. It does seem to have a slightly milder (perhaps smoother) flavour. The caramels get off to an easy start with all the ingredients (bar the pecans) measured into a saucepan. This is easy, I think to myself. Of course, it's not really. 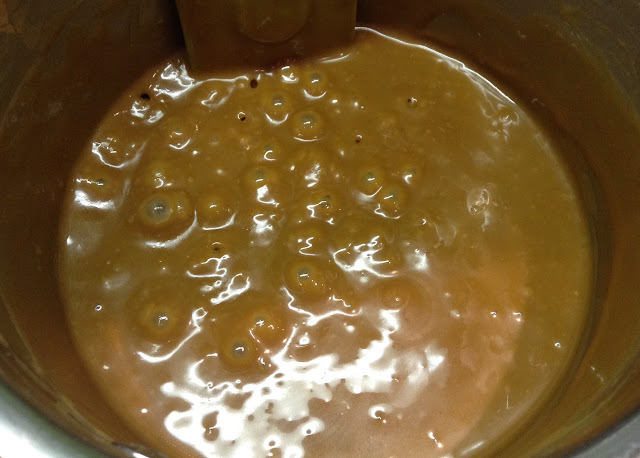 There's a trick to caramels and it's in the cooking time. And possibly the stirring, which has to go on, and on, and on. If I was to make them again I would double the recipe, at least, because it's a lot of stirring for not many caramels. 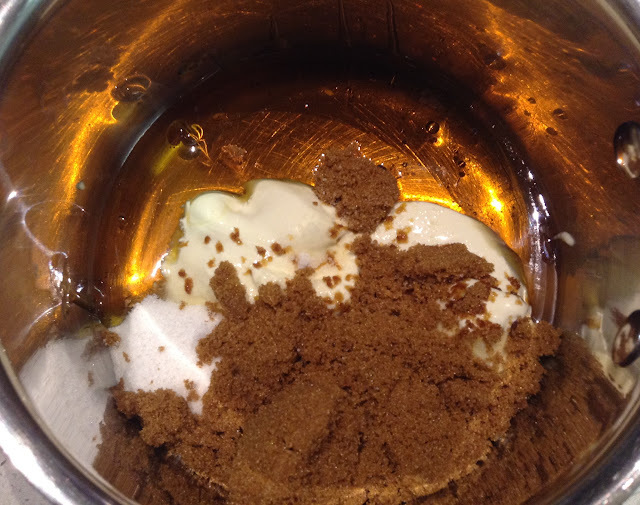 I was just relieved that when I brought it to the boil, the sugar didn't crystallise (my perpetual toffee problem). 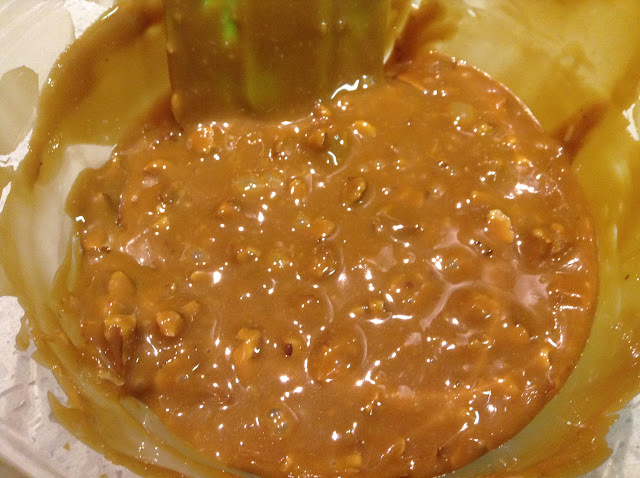 After testing the temperature of the caramel at least 300 times, it was finally ready to mix with the toasted pecans. It was pretty sticky at this stage and I was forced to lick the mixture off several spoons, discovering in the process how delicious it was. Blobs of the caramel is dropped onto oiled foil and cooled (in the fridge in my case). I didn't try and persuade them into neater blobs as suggested in the recipe. I'm all for letting blobs be blobs. This week we're making Rum Raisin French Toast Royale. This entails baking the raisin bread first before making it into french toast. We're nothing if not dedicated in the Alpha Bakers. Brilliant post! "(is gluttony an occasion? )"-yet another great slogan for an apron! 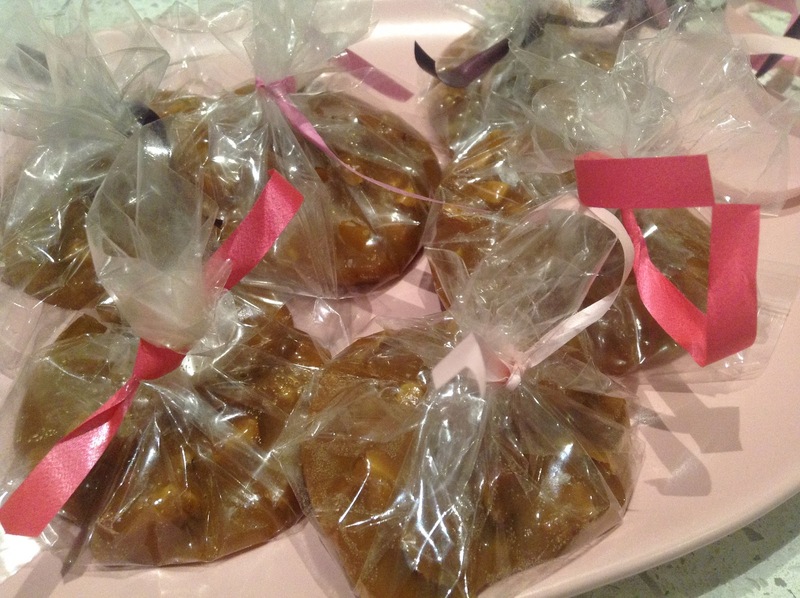 Your caramels are so pretty wrapped up with a ribbon and all for you after long, hard day at work. Well deserved, I'd say, after all that stirring. Phylliscaroline , your look nice with the wrapping plastic.